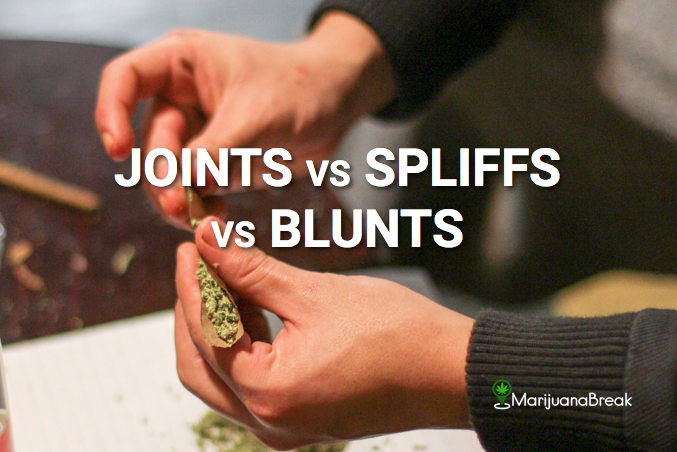 While most websites may use the terms, “joint,”“spliff” and “blunts” generally, in sentences meaning the same thing, these terms describe completely different types of marijuana cigarettes. A joint is a rolled up cigarette that contains only marijuana. It can be whatever strain you want, but it only contains weed. A joint is rolled from rolling or cigarette paper that is usually composed of different materials such as classic wood-pulp to exotic rice. Oh and hemp paper. A joint is typically 3 inches long. Similar to a joint, a blunt is made out of marijuana only, but instead of rolling it with standard rolling paper such as zig-zag or some other brand, this time it is rolled from tobacco paper. Blunts are often also created from cigar wraps made from tobacco leaf. Unlike a pure joint, when smoking a blunt, you will taste a tobacco flavor. A spliff is a kind of like a hybrid between the two. They are usually rolled in the same papers as joints, but these time the spliff is filled with a mix of tobacco and marijuana.